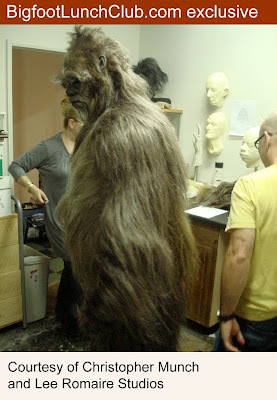 Ever since Darwin, Werewolves have lost their glory as the king of hirsute bipedal beasts. We have always believed werewolves (fake) have been misidentified Bigfoot (real). Now it may be the other way around. 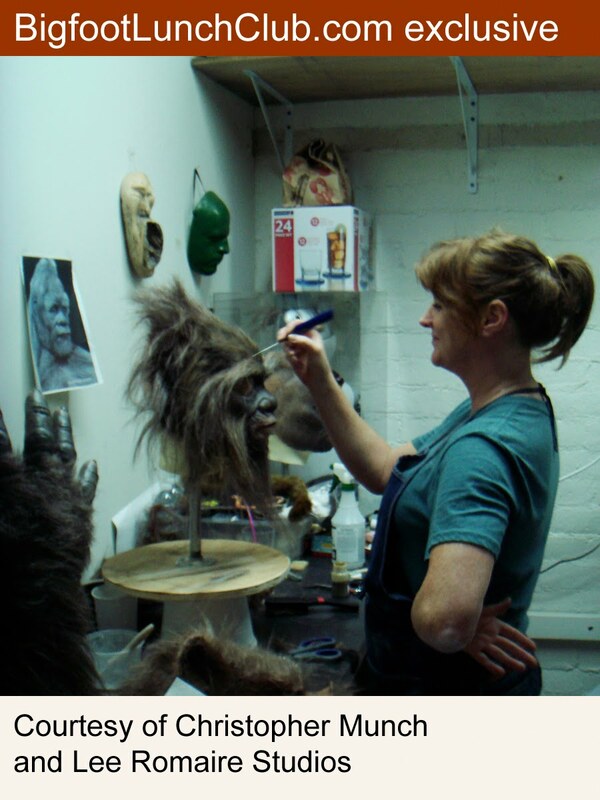 In our previous posts, Bill Munns speculated that the above photo on the left had used fur that was familiar to the creature FX world (read his full opinion here). 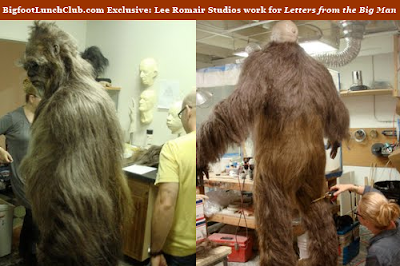 Lee Romaire, creature designer for Letters from the Big Man, was able to name the fur he had thought to be used in the fabrication of the picture (read his full opinion here). The name of the fur was NFT Werewolf Fur. 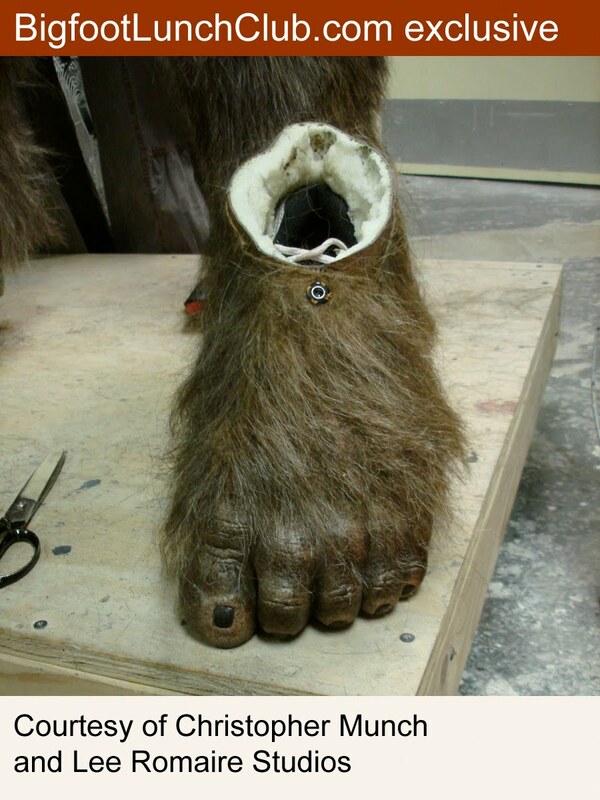 Fellow Bigfooter, Rodney Young, posted some pictures on Facebook Group, Coalition for Reason, Science, Sanity in Bigfoot Research. 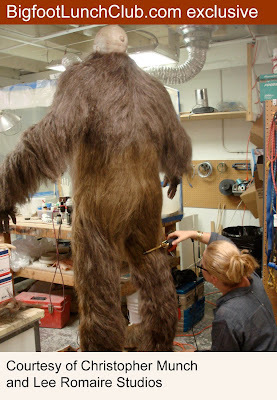 He decided to request samples of Werewolf Fur from National Fiber Technology (NFT) and photograph the samples on the back torso of a mannequin for comparison. Rodney was able to use varyious lighting and backgrounds. MAXIMIZE the slide show below to see high-definition detail and click "SHOW INFO" for NFT product description used in each photo. Whether it is stars aligning just right or coincidence, we can agree on serendipity. When Melissa Hovey's picture of the back of a Sasquatch came out, David Claerr was already working on an article about the anatomy of the upper torso of Sasquatch. 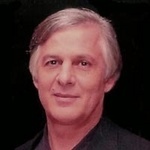 David has written multiple articles, each one with rich 3d illustrations. Yesterday he released one that is related to the Melissa Hovey photo that has made the internet rounds (see below). 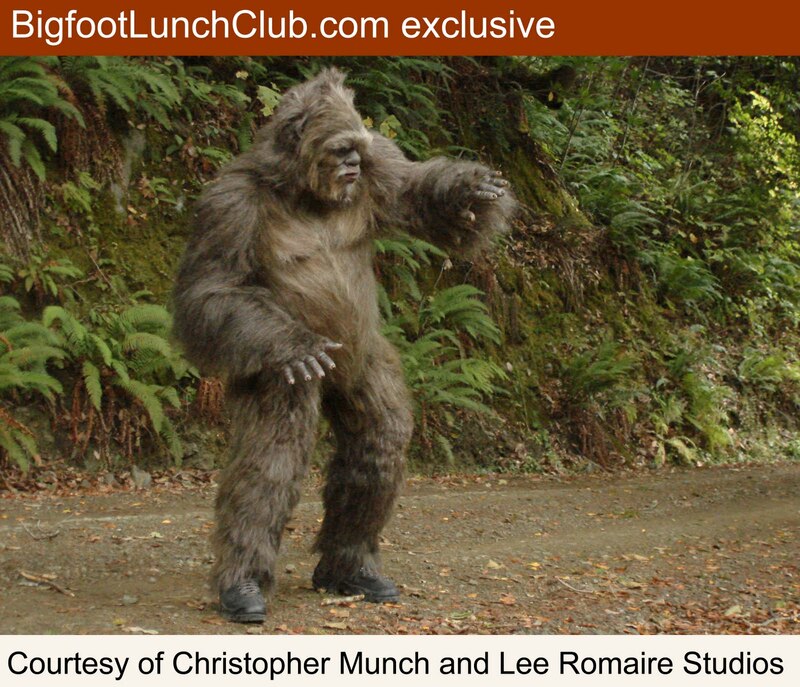 As you may know at Bigfoot Lunch Club posted a few opinions from Special FX experts. 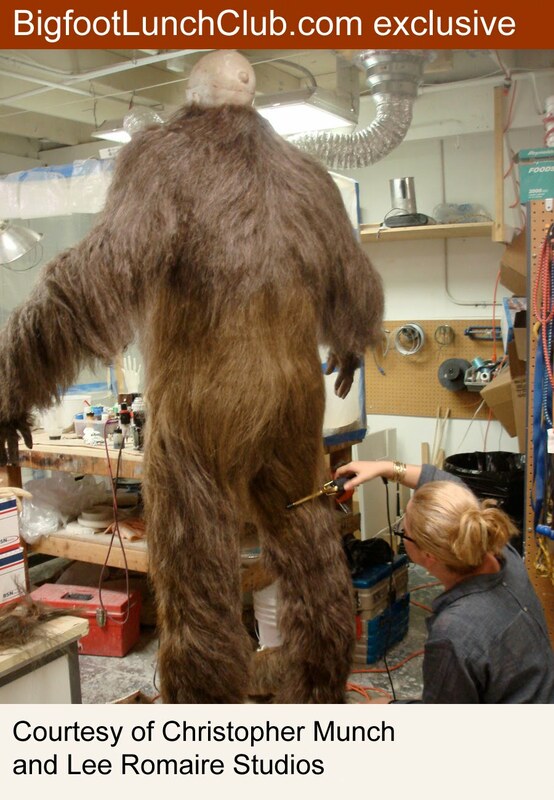 The first one was from Bill Munns, creator of the life-sized Giganto Pithicus, and the other opinion was from Lee Romaire, who created the Bigfoot costume for Letters from the Big Guy. Click the following links to read Bill Munns' opinion and Lee Romaire's opinion. Now we have another professional opinion specifically targeting the perceived anatomy of the photo. 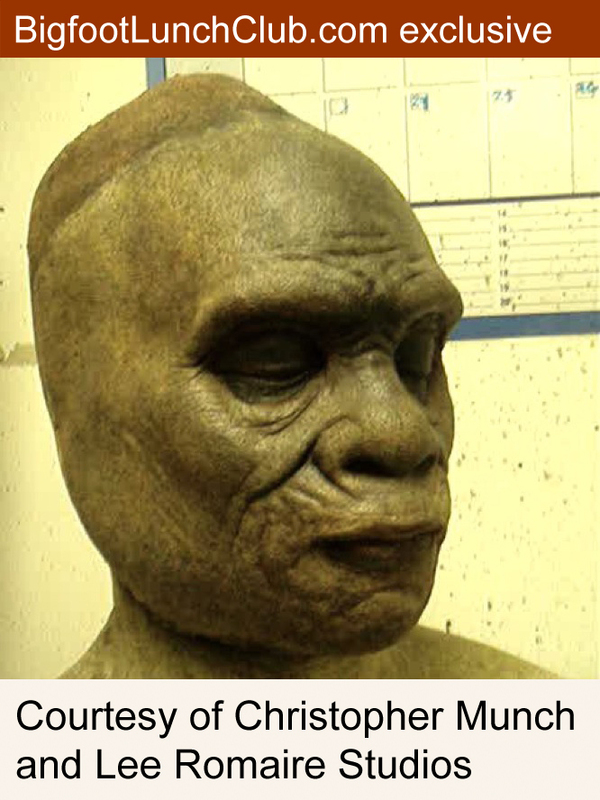 Read an excerpt from David Claerr's post titled, "Bigfoot Back: The Upper Torso of a Sasquatch - Posterior Anatomical Study" below. 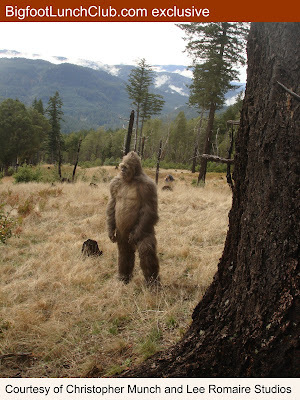 The recent release of a photo purported to be that of the back and torso of a Bigfoot or Sasquatch has many intriguing elements that correlate to the findings of my current research and interpretation of the Sasquatch musculoskeletal system. Although there is a possibility that the photo is the product of an artfully crafted hoax, there are number of characteristics in the appearance of the figure that oddly and coincidentally resemble the latest series of anatomical illustrations I was working on when the photo was released. A mature Sasquatch or Bigfoot has a skeletal structure that is similar in most respects to that of a human, differing mainly in the overall size and in the proportional relationships. 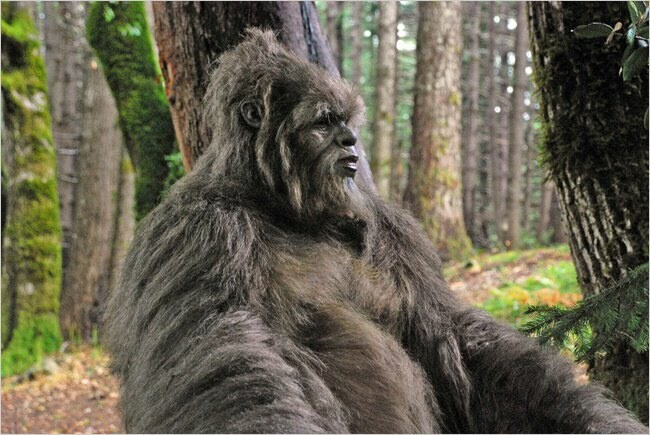 The torso of a Bigfoot is typically much larger and massive than that of a human, with a barrel chest, and broad, high-set shoulders. As you may remember from an earlier posts, Letters from the Big Man, was an attempt to make the most authentic depiction of Bigfoot, not only in behavior but also visually. Lee Romaire, in our opinion, succeeded. Bigfoot lunch Club was provided exclusive photos and a test video of the Bigfoot costume. You can also see a few examples of Lee Romaire's work below. You can see an artist cutting the hair to different lengths as mentioned in Lee's opinion. "In my opinion it's fake. The hair used here is identical to an expensive brand of fake fur that we use. 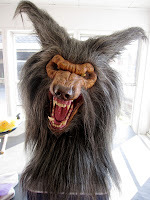 This particular fur type is called werewolf fur, woven on a 4 way stretch fabric (which is identical in color to the skin showing under the fur in the photograph). You can order this fur in medium or sparse density, and this one looks to be medium density. The fur is simply too uniform in color, density and direction to be authentic. Even though this is a high quality fur, it needs to be trimmed, painted etc. to achieve a hyper realistic look. The skin is also too uniform in color. If one was able to zoom in very tight on this photograph and manipulate it I'd bet that you'd find a weave pattern on the skin areas." To make [recreate this exact photo] in your garage would probably cost less than $800. 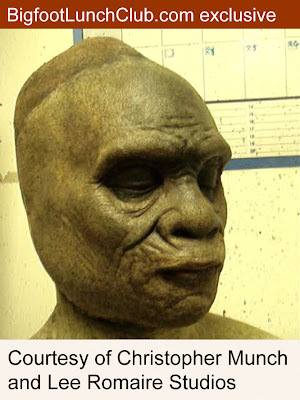 UPDATE: Lee Romaire wanted to make it clear that he did NOT mean a Bigfoot costume could be made for $800, he has emailed us with more specificity, "what I meant by that photo being created for $800.00 is NOT that you can make a whole suit, but someone could sculpt a bust from the back up (with no detail on the face, paint it and stretch $500 worth of artificial fur on it and it would produce that shot."" 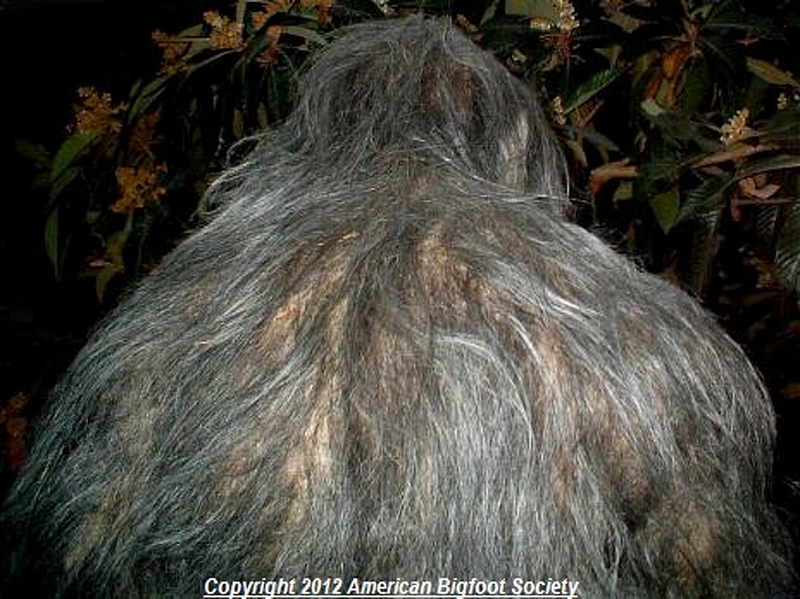 He continues, "I believe that bigfoot is real, and that I have been fascinated with the subject for years. People have asked me to comment on the Patty footage, but I want to believe it's real too badly to be objective." Lee's opinion matches up with our post yesterday featuring Bill Munn's expertise. Also, in our opinion, we wouldn't worry about these being tips for hoaxers. Any body with the time and talent for this stuff is already using those two resources to make money in Hollywood. 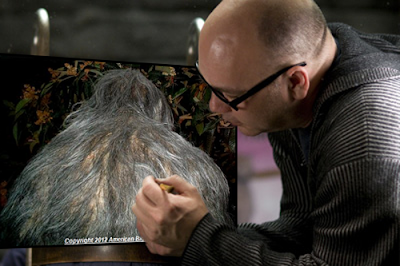 And as you can see, even two FX experts and Bigfoot hopefuls (if not full-on believers) can detect details of fabrication. Neither one of them had see the other's opinion. You should read our post, "The Making of Letters from the Big Man" to read our interview with Lee Romaire and learn how he collaborated with Christopher Munch on the Sasquatch design. 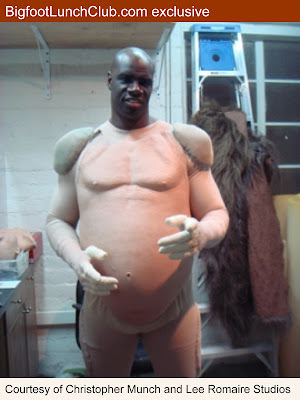 Also, Be sure and check out Lee Romaire Studios, he's been working on a lot of great stuff lately, from the animatronic Lincoln for Disney, to an animatronic goat for Sacha Baron Cohen's newest movie The Dictator. We will always appreciate the respect and work he put into Christopher Munch's Letters from The Big Man.